"I am a 2nd generation pharmacist, as my father is a pharmacist. Growing up with pharmacy around me influenced my decision to choose pharmacy as a profession. Through observing my father and starting my career as a pharmacy technician, I was able to see firsthand the impact of how community pharmacists can make a difference in patients' lives." "I had been fortunate to receive good advice early in my career. I was counseled that in order for me to make a difference in any future role, it would be critical to have diverse experiences to provide value and allow you to have different points of view to improve upon today. Because of that advice, I was able to have varied experiences throughout my career, between providing patient care, product development, operations, clinical pharmacy, market access, specialty, and much more. This allows me to have a comprehensive approach in leading pharmacy operations for the organization." "My family has been my inspiration in my career as they continue to be my focus on how we can positively improve on patient care and the team member experience." "First of all, the workforce is primarily women, and having female leadership will allow for the workforce to be represented equally. Secondly, the industry benefits from diversity of thought as the industry needs to evolve to be relevant." Although women make up most of the healthcare workforce, they hold only 19% of hospital CEO positions, and they head only 4% of healthcare companies. What challenges do you think women healthcare leaders face in their career? What challenges, if any, have you faced in your career and how have you overcome them? "Across the healthcare industry, and specifically in the pharmacy business, women leaders face challenges to break through the existing circle of legacy leaders that is primarily comprised of pharmacists from years ago. I have personally experienced such a barrier to entry, but was able to overcome this through having advocates within our organization. These advocates recognized my hard work, diverse expertise and leadership skills. They helped open doors in order for me to have a seat at the table." "The pharmacy industry today continues to face challenges and requires innovation and a different approach for the future. I would recommend women be inquisitive, look for diverse experiences, build relationships with colleagues across the industry, understand what drives the profession and how we can make it better." which leverages the expertise of more than 15,000 of our combined pharmacists and beauty consultants who have received special training to provide holistic care for people living with cancer." 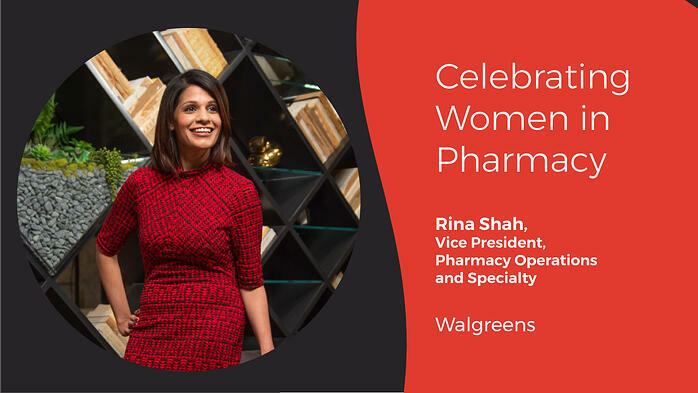 Know any awesome women in pharmacy? Tell us about them by leaving a comment below!